This is a cake I did for a little boy’s first birthday. Everything is edible (minus the tooth picks). 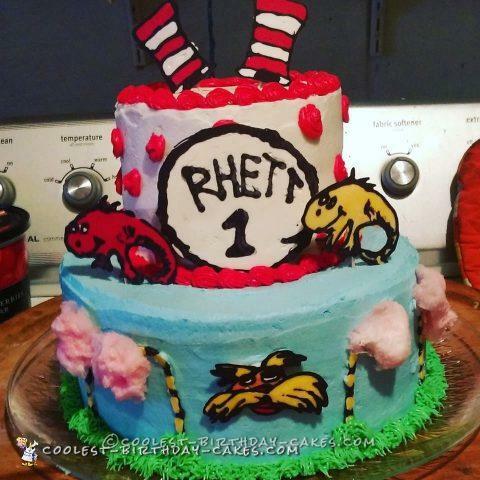 The hats, fish, thing 1 emblem, the lorax, and the trufella tree trunks are made from melted chocolate. The most difficult part of this cake was keeping the cotton candy from melting! I had to change the cotton candy three times to ensure the trufella trees were still fluffy and pretty for the party! Bottom tier is triple chocolate, top tier is white vanilla, and the icing is butter cream! I also made a smash cake in the form of the the Hat from The cat in the Hat. This was a very fun cake and I learned so much while doing it! Not too bad for a novice, in my opinion!